WooHoo! I'm SO excited, it was time to get a new SUV and I've been wishing for a Ford Escape since I saw one at a show in January. I picked it up Friday night! I wasn't planning to get blue but as soon as I saw it on the lot I changed my mind, it was so pretty! 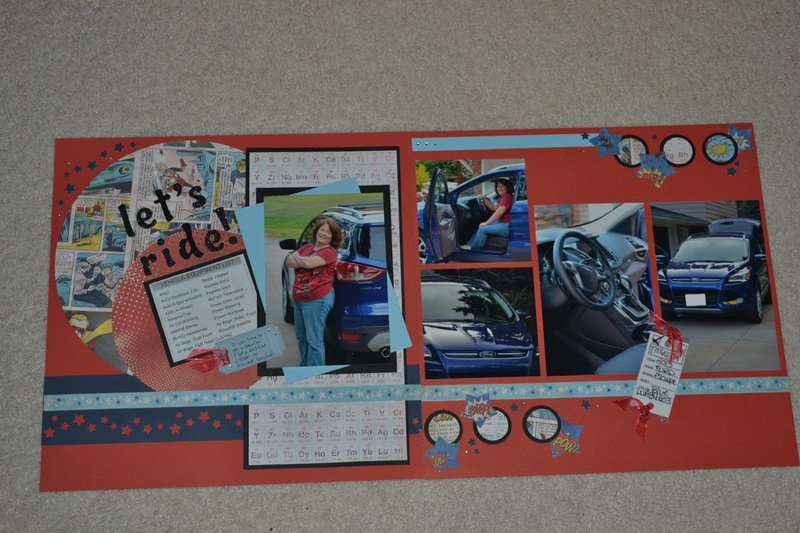 My DH was chuckling about that I already scrapped pages about my new ride, LOL! 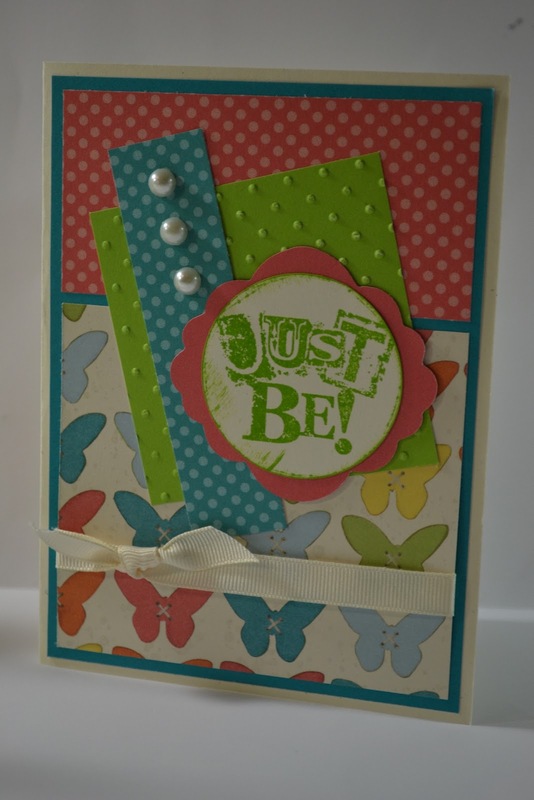 The first page I used the Paper Secrets SYAO Sketch. The 2nd page I used the Friends That Scrap August Sketch page. 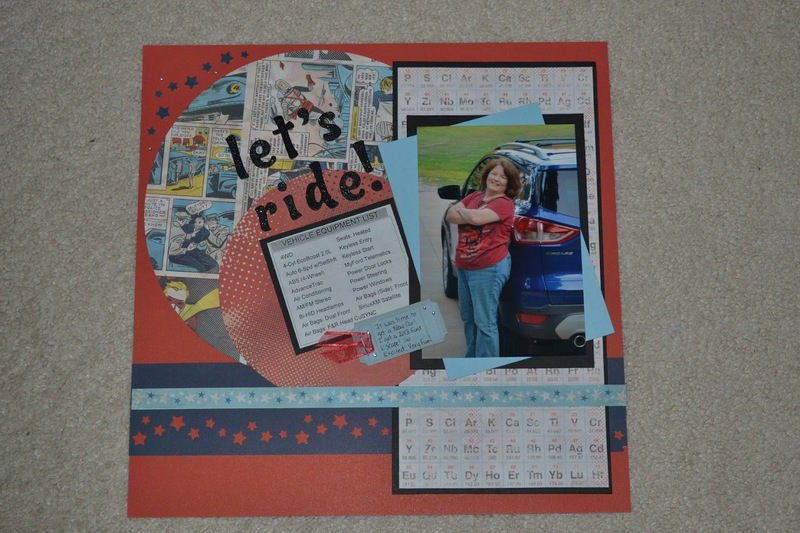 Of course, it only seemed fitting to use the CTMH SuperHero's paper.... Scrap On! merry & bright - August? Yesterday we had a GREAT time with a visit at the Zoo but it was 93 degrees and hot-hot-hot! It was still a great visit but it also makes me think that it's the end of August and all too soon the holidays will be here so tonight's MOJO Monday #255 seemed like good inspiration for some holiday cards. 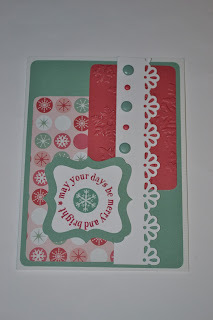 I do have to admit the CTMH Jingle Paper is my absolute FAVORITE for holiday paper! The colors are SO Fun! 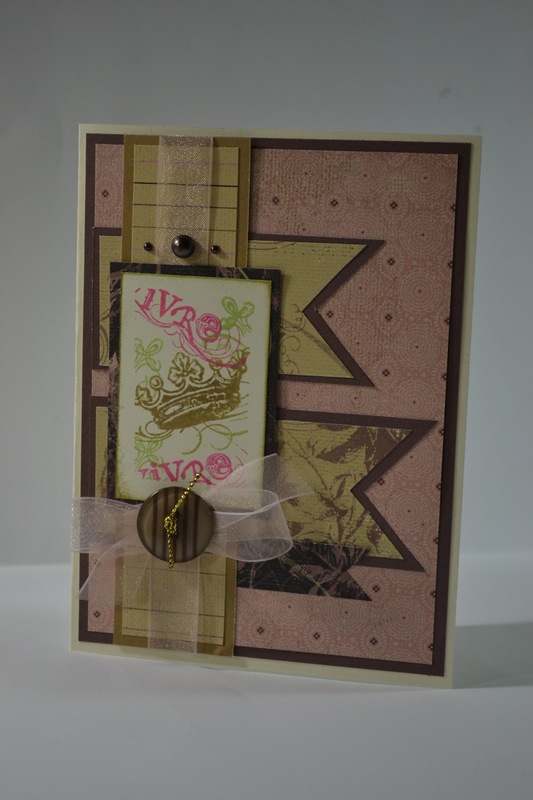 This card is also for this week's CYAO #29 Challenge over at Paper Secrets. We all have things we have to do that we don't like to do. One of those things I really don't like to do is "buy a car". I can't stand the process! It always feels like they're not telling you the truth and tonight was no different. As soon as he comes out with the numbers, the red flags go up. Not anywhere close to what they led me to believe....GRRRR! I was so disappointed (okay, read really ticked here) that I left. 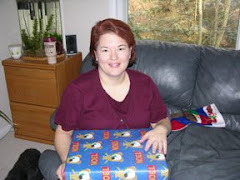 After I was home, my hubby, bless his heart, helped me spend time going through looking it all up on the internet and we determined they were not being as honest with me as they could have. We called back and ... imagine ... they're so sorry and they can make the deal that was more fair for both of us. Again grrr... It all will work out and afterwards it sure made me have a sweet moment for DH. After 24 years, he's still the one :) After we were all sorted out, he said "go stamp or scrap something, you'll feel better". 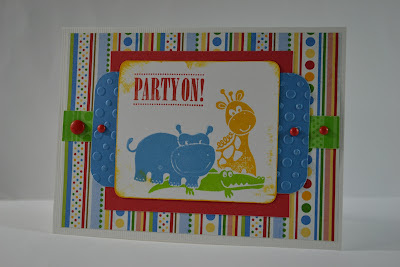 He brought me an Iced Coffee and so I'm sipping away stamping and you know what, "it's better"! Stay Inspired! 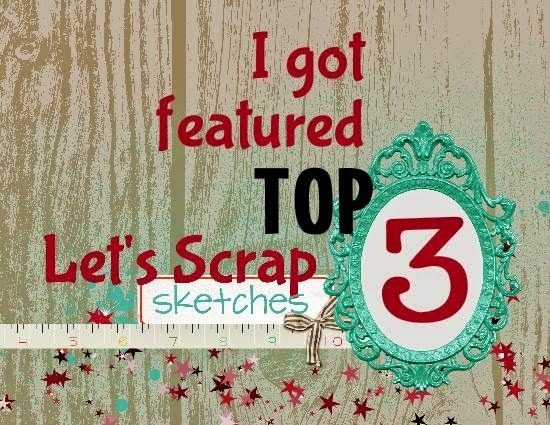 This sketch is this week's iSpy Sketch #29. These paper are the new CTMH La Belle Vie. 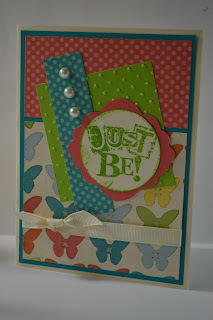 I actuallly wish the stamp sentiment said "Just Be You" but it's still fun and funky the way it is. 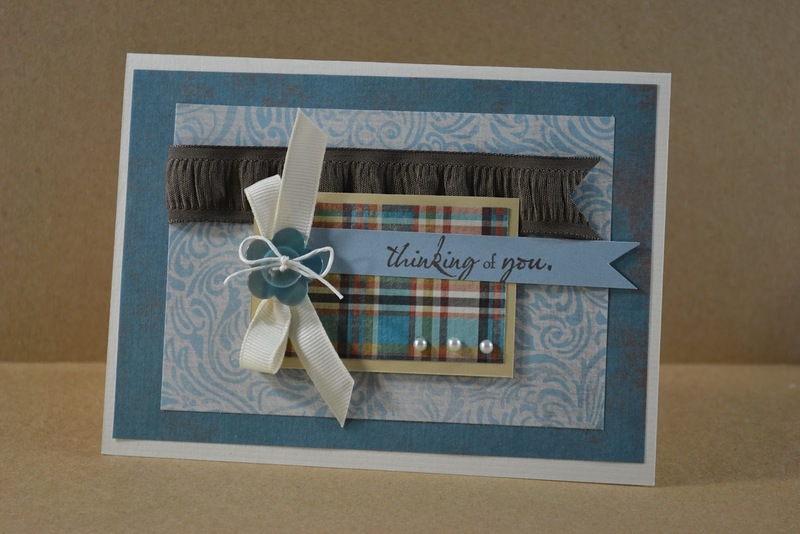 It goes great with the inside sentiment which says, "Imagine the Possibilities". That's fun too! 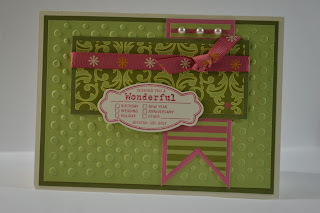 I love this paper and the fun colors and have to admit, "I've been hoarding it ..."! Yes, yes, I know ... not sure what I was saving it for because now all of the awesome Fall/Winter papers are out and I'd rather play with those, LOL! Go figure! 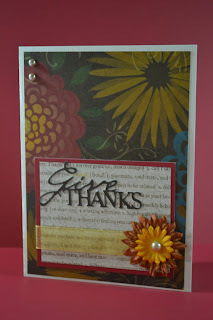 Tonight though, it was time to break out the "Dotty For You" Paper pack because this week's challenge at H2H is to use -- Lagoon, Pear and Sunset. My first card I ended up with more Smoothie than Sunset although there is alittle so I did a 2nd card but ran out of Ivory Ribbon --- aahh! I went for Lagoon Seam Binding but not sure it turned out exactly as I wanted. It's all good because my cards for this week are done and ready to mail! 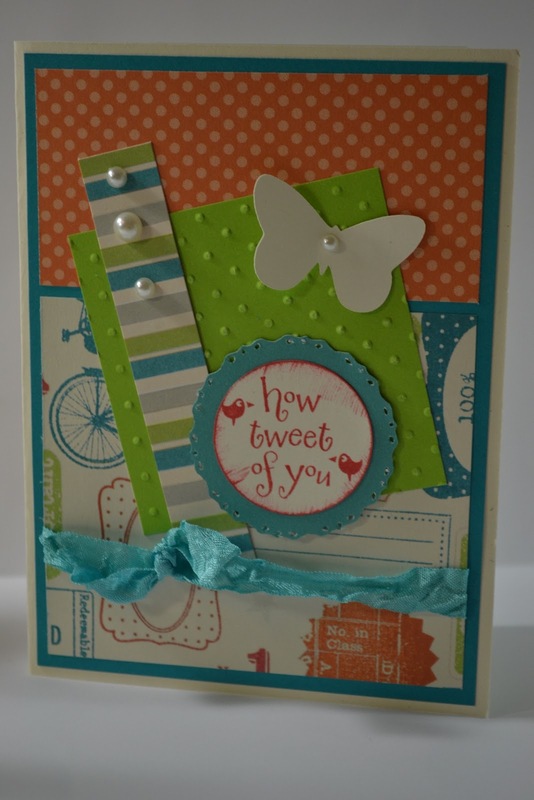 On my 2nd card I added a different sentiment so it worked for the Perfect Sentiment Challenge this week - how fun! 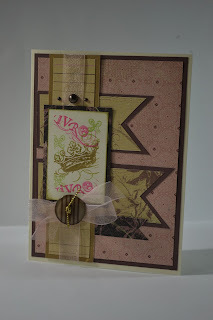 I don't want to forget the card sketch came from SCS Verve Challenge. Fun Sketch - lots of layers! Thanks for stopping by! How Tweet of you! Imagine the Possibilities! Happy Sunday Evening! I hope you had a blessed day. 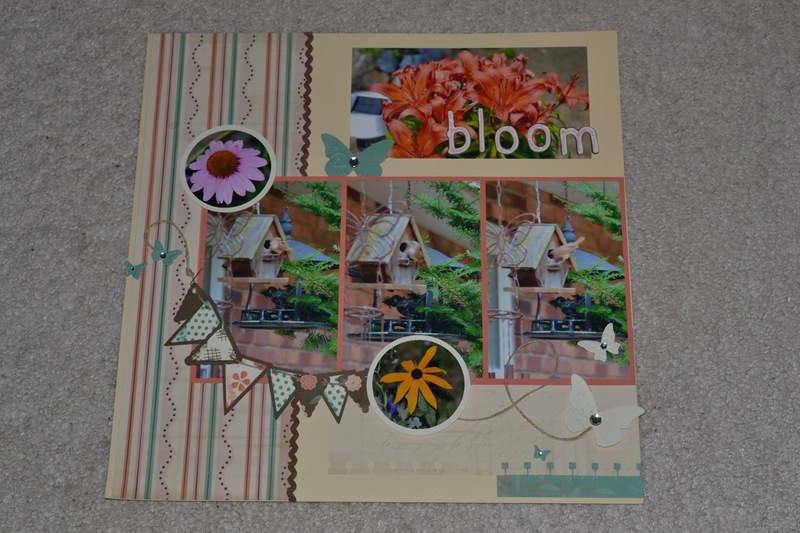 Tonight's been another evening of enjoying playing with all of my paper and craft goods. I've been --- s-t-r-e-t-c-h-i-n-g --- this paper pack as much as I can because it's some of my FAVE of all time! This was a Creative Basic Paper Pack called Boom-Di-Ada. The Olive and Hollyhock are so pretty together. 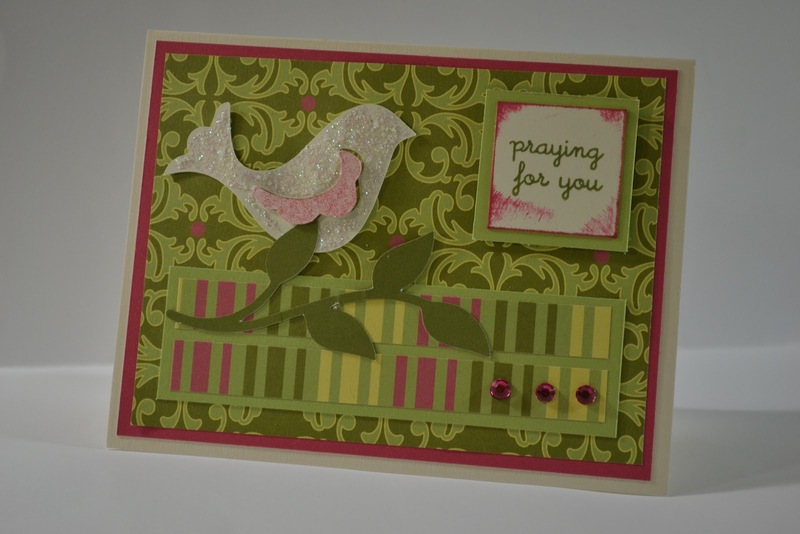 Imagine how happy I was to see the challenge over at Color Dare this week was to use Hollyhock, Olive and/or Blush together. I even still have a few scraps left for another day, LOL! I used the MOJO Monday #254 Sketch. Stay Inspired! This year as I've posted previously I need more "guy" cards. 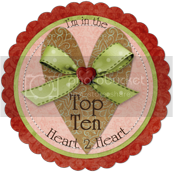 I have 4 I need to send out weekly. While that's fun, it's challenging. Since I've been scrapping "boys" for the last 10 years you would think it would be easy to pull out those papers from the stash and come up with something. It seems to be slightly more difficult than that although, I'm getting better at it. I found the last scraps of this CTMH Paper Pack - Sasparilla while looking for paper from yesterdays card and decided I would used it up. 4 cards later and I definitely think these will work for the men in my life that get cards. This cute sketch is from this week's I Spy Challenge #28. CPS #277. I was playing with my Cricut Cartridge Artiste and that's where I got the ideas to cut the words. I think this card will work well as I continue to need more guy cards. Thanks for stopping by! Whew, everything seemed to take twice as long today as it should have, ever have one of those days? It felt late the moment I got up and it was just because there was so much I wanted to do so I could get home as close to 5pm, have dinner and dig into my box of *NEW* CTMH goodies! 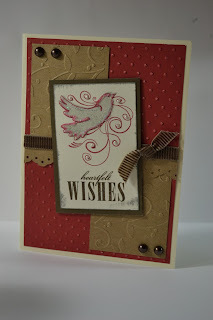 Enclosed, my Ruby Cardstock and that's what I needed for the challenge over at Color My Heart. The sketch is from past MOJO Monday #249 challenge. It's been laying here on my desk, I missed that one. 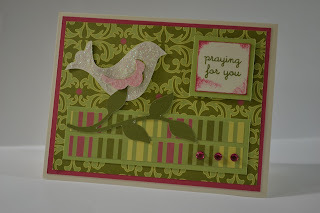 It was a good sketch to use for the Clean and Simple "Sympathy" Challenge over at Perfect Sentiments and at H2H. 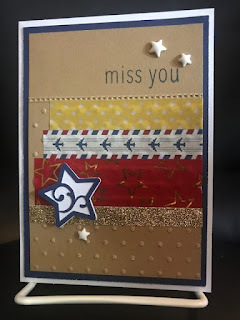 This card is for a co-worker of mine who is having a rough time. I sincerely hope life gets better soon and things get back to more normal for her. Woohoo! 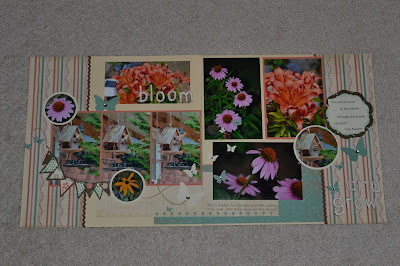 It was a great scrappy evening and for some reason when I saw the SYAO #28 Challenge tonight at Paper Secrets I was inspired to get scrappin'. I had also been looking for some photos for the S.P.L.A.S.H challenge at FTS and what's better for summer photos than my flowers and bird house in my own backyard. Page 1 is my SYAO Challenge page and it's a sketch from PageMaps. 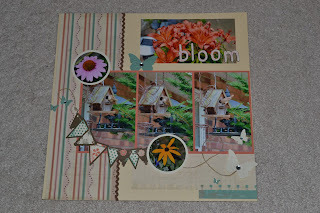 Ok, I just couldn't resist .... my new CTMH Avonlea Paper arrived and it's been calling my name, LOL! I love the colors that came with it. I'm thinking already that I might have to order another pack. 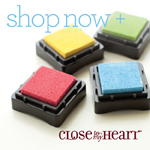 It's great colors, especially for Fall. 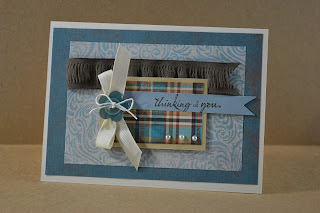 Someone else also suggested it would be pretty holiday paper ... ohhh, I like that too! 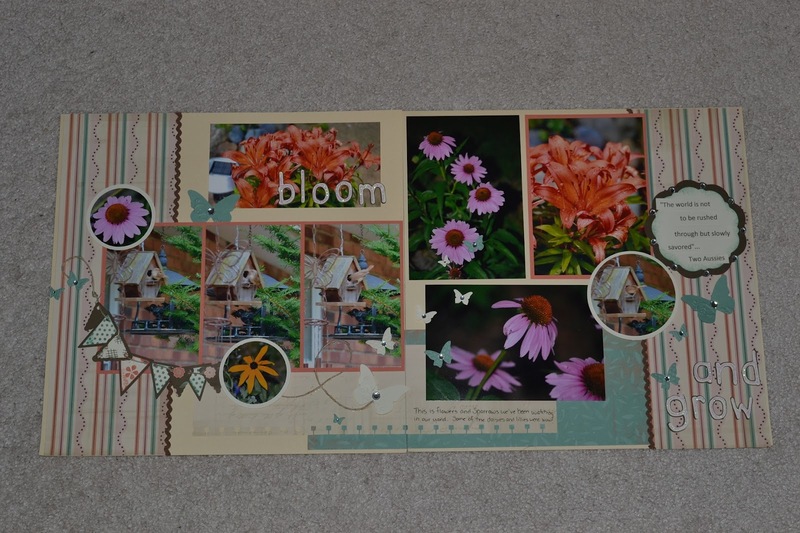 Here's my layout for this week's SYAO Challenge over at Paper Secrets. The sketch is from this month's August PageMaps. This will be the last page in my DS Album for Jan-June 2012. 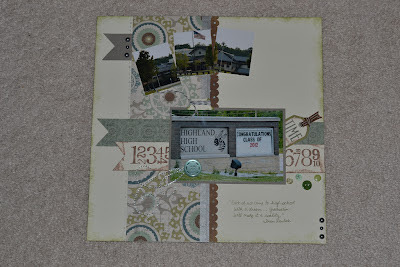 I wanted to use this picture for the August "Time Will Tell" Challenge at Scrap Our Stash. It's a FUN weekend at my house as my son's are home from college for a visit. This is the first time both of them have been here at the same time in a long time so it's nice to have them back home. Love it. This card is for my nephew birthday. 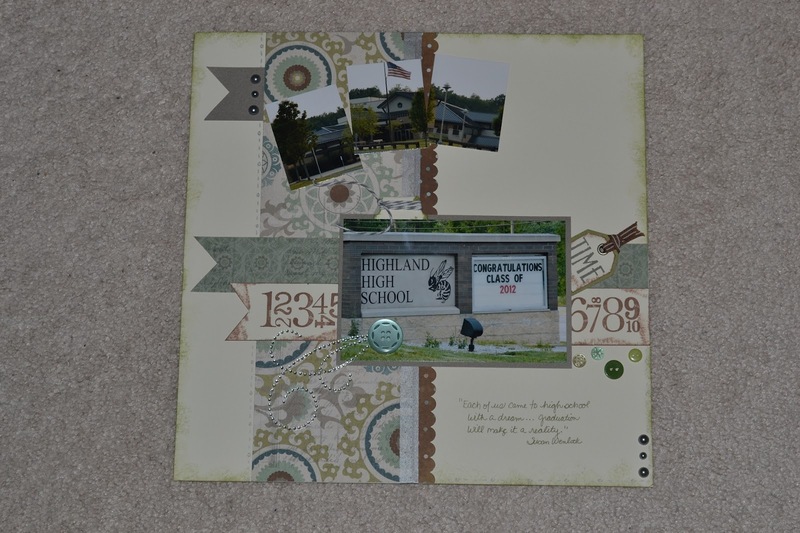 The H2H Challenge this week was to use scraps. I started with the CPS Sketch #276. It's always a fun challenge to use scraps and this paper always make me smile!